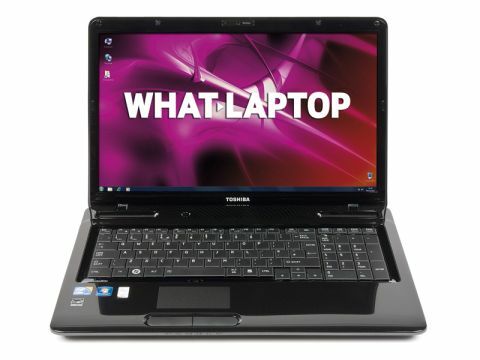 Toshiba's Satellite range is hugely varied, covering everything from entry-level budget laptops to multimedia powerhouses. The Satellite L670-12J is a sturdy mid-range desktop replacement machine that makes up in power what it lacks in portability. The 2.8kg chassis is one of the heaviest and bulkiest in its class, beaten only by the HP Pavilion dv7-2045ea. It has a solid build that can take a few knocks if you venture out on the road, but the battery life of just 208 minutes means you'll need to take the charger on longer trips. The lightly patterned design is more subtle than the HP's, although the shiny surface is just as bad at picking up dust and fingerprints. The 17.3-inch display is also near identical to HP's widescreen offering and just as good for watching movies, as well as working on your documents side by side. Images are sharp, thanks to the 1600 x 900 pixel resolution, and the glossy Super-TFT coating brings colours to life, creating a vibrant picture. The full-sized keyboard, complete with dedicated numeric keypad, is one of the benefits of the large chassis, and usability is excellent. The keys are a joy to type on and firmly set in place, as are the two mouse buttons beneath the touchpad. The touchpad itself is a little cramped, but the textured surface is responsive and it can be turned off using a button on the chassis, just like the HP. With an Intel Core i5 processor on board, performance was excellent. Only the Core i3 Acer and Hi-Grade came close, but this laptop comfortably beat them in our benchmarking tests and proved itself capable of multi-tasking with even the most intensive applications. Anyone who needs a solid amount of power should look no further. Unfortunately, while the Acer comes fitted with a dedicated Nvidia graphics card, this laptop makes do with an integrated GPU. The resulting 3D power still beats the Sony VAIO VPC-Y21S1E/SI and even the Mesh Discovery 16-RV, which also features an Nvidia graphics card, but only the most basic games will run and multimedia tasks are limited to editing photos and watching movies. Features are standard at this price, with 802.11n Wi-Fi and Gigabit Ethernet available for networking and the usual three USB ports for adding peripherals, one of which doubles as an eSATA port. VGA and HDMI outputs and a memory card reader round off the features. Portability may be limited and a dedicated GPU sorely missed, but the Satellite L670-12J is a strong performer and a highly usable laptop – easily recommended as a desktop replacement machine.